This delightful ensemble for girls is a gift that will be appreciated both now and for a lifetime. 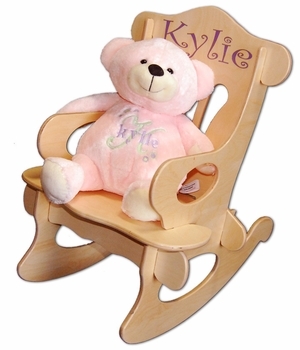 This beautiful set comes with an adorable pink teddy bear standing 16 inches tall as well as a durable baby rocking chair, both are artfully personalized with child’s name! The chair is made using the finest 3/8 inch Birch plywood and assembles very easily. It measures 13 inches wide by 19 inches high and the seat is 8 3/4 inches wide. The rocker is also engraved and then painted with the child's name on the back, then coated with a clear finish for long lasting protection. Please note, the chair will arrive unassembled. It is easily put together without the need for tools or additional hardware making it ideal for travel too! Please allow about 2 weeks for the personalization to be completed.